I’ve been eagerly awaiting the release of this episode of Add Passion and Stir because of the two amazing women in it: Arianna Huffington who founded the Huffington Post, and now Thrive Global, along with chef Claudia Fleming, a longtime Share Our Strength supporter from her days at Gramercy Tavern and now at the North Fork Table and Inn. It’s a great conversation about how to change the world by investing in yourself, your health, and your creativity. 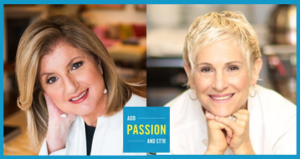 Listen in at http://addpassionandstir.com/arianna-huffington-sound-asleep-and-still-changing-the-world/ or on iTunes https://itunes.apple.com/us/podcast/add-passion-and-stir/id1164624510?mt=2 Enjoy and please share.